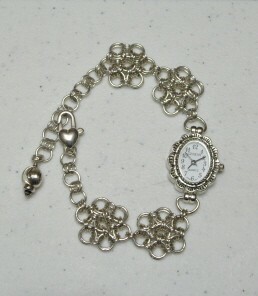 The Flower Watch is a Japanese weave that is beautiful on the wrist. I have made it with an adjustable length which is nice especially if you are making it for someone else and don't know their exact wrist size. The kit does not include the watch face or end charm. A sterling silver or yellow gold filled balloon clasp is included in the kit. This is a beginner project.